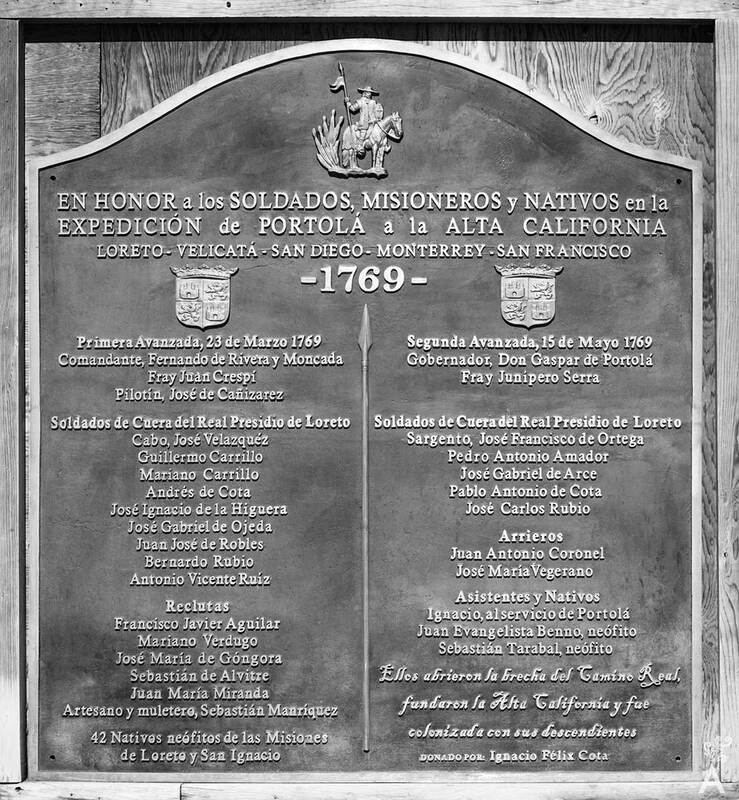 “Our goal was to rescue the legacy of the “Soldados de Cuera” from the Portola Expedition. In1769 the soldiers marched from Loreto to establish the Spanish colony in Alta California. They built presidios, missions and towns in San Diego, Los Angeles, Santa Barbara, Monterey and San Francisco”. 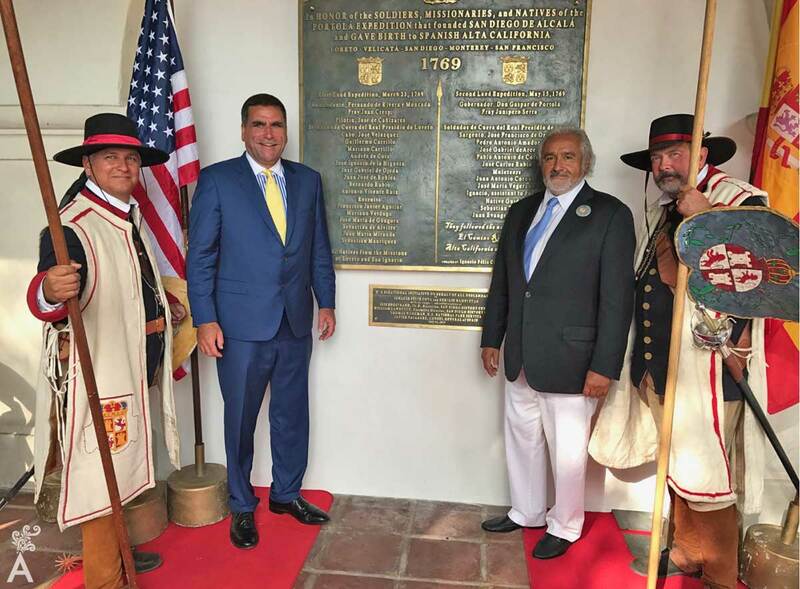 Two Californios, Ignacio Felix Cota and Enrique Hambleton descendants of the Soldados de Cuera, took it upon themselves to coordinate the placement of commemorative plaques in both countries to honor the memory of these men. They are the patriarchs of Californias oldest and most influential families, from San Jose del Cabo to San Francisco. Like putting a puzzle together made of historical documents and family memories, the Cota family gathered information about its origins and ancestors. The Soldados de Cuera where men with values and determination, that made the expansion of the Camino Real from Loreto to Alta California possible. 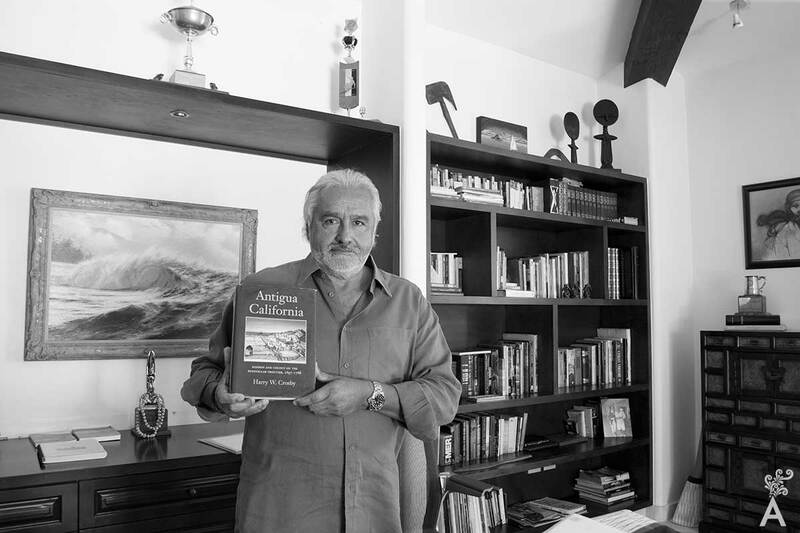 Ignacio Felix shares his project, The Rescue of the Historical Legacy of the Founders of the Californias, in collaboration with Enrique Hambleton. After years of travel following the tracks of history, the project has become a reality. “It all began in Ensenada with my mother’s passion. Olga Cota dedicated part of her life to the genealogical research of the Cota family and relatives, the Verdugo, Castro, Amador, and others. Their origins were in Loreto, El Real de Santa Ana (today’s San Antonio), Todos Santos and La Paz, Baja California Sur. 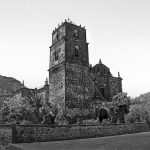 My mother was helped by the “Guia Familiar de la Baja California, 1700-1900,” a magnificent work by Pablo L. Martinez that provided a record of all baptisms, marriages and deaths from that period. 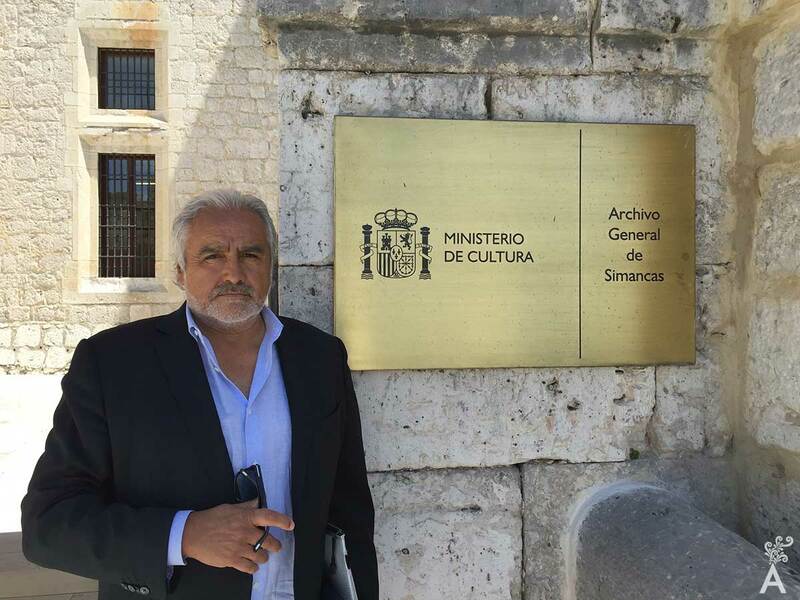 Working through the files, Ignacio observed the brave Soldados de Cuera deserved much more recognition. The military detachment was named for their leather clothing. The soldiers dedicated their lives to taming the wild lands of California. They cleared the way between cardones cactus and thorn bushes and expanded the Camino Real from San Jose del Cabo to San Francisco. They explored the north coast and established San Diego and they left a legacy that history has omitted for years. Their descendants have managed to rescue the soldier’s history and it is time to recognize their accomplishments. They built the first pueblos of Alta California together with the Kumeyay and Chumash natives. Many of these families remained to colonize while others returned to what it is today Baja California Sur. As a result, the great distances and political changes caused them to lose contact. During México’s Independence, the colony was practically abandoned until 1820-21 when a Mexican government was established. In the case of Alta California, the government lasted for just 27 years due to the invasion by the United States in 1846-47 and the 1848 Treaty of Guadalupe Hidalgo. National borders eventually divided the Californias and put an end to the connections between the old Californio families and their descendants. The soldiers of the Real Presidio of Loreto who with great risk and sacrifice escorted Portola and Serra to fulfill their mission. Unfortunately, it is sad to see that the names of these men are not included or mentioned in the history books. With the birth of the new nation and new frontiers, the only stories that survive are those written by the missionaries. The Soldados de Cuera protected the missionaries, helped build the missions, expanded the Camino Real to Alta California and together with Kummeyay and Chumash, formed the families and communities of the first residents of Spanish California. Like the Camino Real that they constructed, the names of these families should not be forgotten. 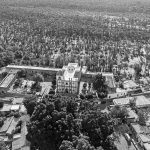 As with every project, the rescue of this historical legacy faced many obstacles, one being the resources and agendas of two different governments. However, the bi-national initiative was made possible with the support of the Historical Archive of Santa Barbara, the Missions Foundation of California, the National Park Service of the United States, the Historic Center of San Diego, the Historical Archive of Pablo L. Martínez in La Paz, the History Museum of Ensenada. Finally, with the help of Don Javier Vallaure, Consul General of Spain in California, and David Bolton from the California Missions Foundation, Ignacio was able to obtain the military service records of the Soldados de Cuera of the Spanish crown from the Archivo General de Simancas in Spain. The project consisted of placing a series of bronze plaques in memory of the soldiers in La Paz, Loreto, Ensenada, San Diego, Santa Barbara, Los Angeles and San Francisco; the prominent cities of the Camino Real. With the support of Iris Engstrand, Ph. D and the San Diego Historical Center, we were able to place the first and most important commemorative plaque in the city of San Diego on July 16, 2017. 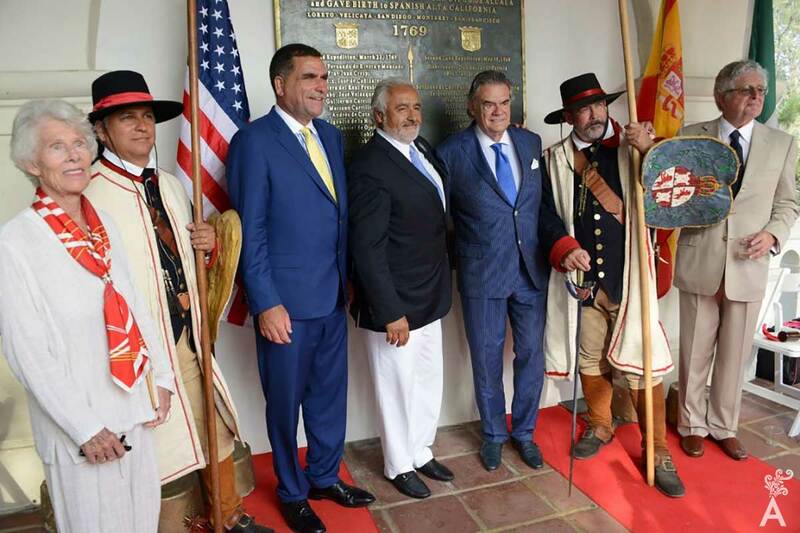 The ceremony was presided over by dignitaries from Spain, California and Mexico and took place at the entrance of the Junipero Serra Museum in Presidio Park, the site where the mission and presidio were established. Quote from Ignacio’s speech in San Diego, California. Who were the founders of the Californias, a province of New Spain back then in the XVIII century? It is generally accepted that the missionaries were the founders of both Californias. However, with the exception of Jesuit missions in the southern part of the peninsula, the colonization of the rest of the Californias was accomplished by a military strategy conceived by the Spanish crown and begun in 1769 with the Portola Expedition. In 1767, King Carlos III empowered Don Jose de Galvez as General Visitor with a royal order to expel all Jesuits from the missions in New Spain. They were to be replaced by Franciscan fathers from California. Don Jose de Galvez was instructed to immediately organize an expedition to Alta California to establish presidios and missions as a strategy against Russian advancements in the territories. The expedition was also to provide shelter from English pirates who preyed on Spanish galleons coming from the Philippines. To carry out the order, Galvez appointed Don Gaspar de Portola as Governor of California and Fray Junipero Serra as Father President of the Missions. These soldiers and cavalry lancers escorted Portola and Serra when they departed from the Real Presidio de Loreto in 1769. With the help of the native population, they extended the trail of what today is the Camino Real from San Fernando Velicata to San Diego de Alcala, which they established on July 19, 1769. Later, they marched to the north of Alta California where, in November of 1769, they discovered the Bay of San Francisco. Neither Cabrillo nor Vizcaino had reported seeing the bay during their coastal explorations of California over the previous centuries. This monumental feat resulted in the establishment of the main presidios and missions of the Spanish colony in California. They included San Diego de Alcala in 1769, San Carlos de Borromeo in Monterey 1770, San Gabriel in Los Angeles in 1771, San Luis Obispo in 1772, Santa Barbara in 1772, and La Purisima Concepción in Lompock in 1787 just to name a few.